For a little extra color in your traditional cross necklace, look no further than this one. 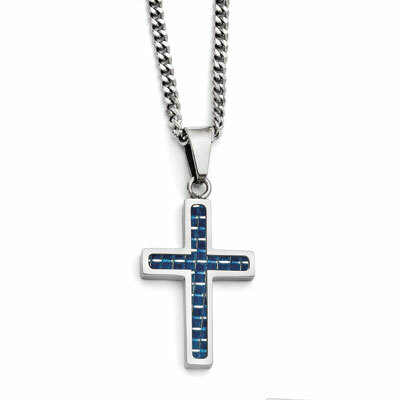 Made out of stainless steel and hanging from a twenty inch chain, this cross features an overlay of blue carbon fiber material to bring it from a regular cross to one that's full of color and will be sure to catch eyes wherever the wearer goes with it. The perfect gift for that family member or friend who enjoys showing the world their faith but already has plenty of plain crosses in various forms. This piece will be sure to stand out in their collection, and they'll be reminded you every time they take it out or wear it. Stainless steel and blue carbon fiber cross measures 29mm (1 1/8") x 19mm (3/4") not including bail. Pendant comes with a 20 inch 2mm curb chain. We guarantee our Blue Carbon Fiber Stainless Steel Cross Necklace to be high quality, authentic jewelry, as described above.